As a school visual arts teacher, one of the questions I constantly grapple with is how to engage teenagers in learning about art and artists. Why should they care about art history? How can they build connections between art and their own lives as well as to the bigger world? I have found that a linear system of teaching art history is ineffective; it’s the practical real life experiences that have, in my experience, produced the best results in every aspect of my teaching and my students’ learning. These were my thoughts when I challenged my Form IV students to develop their last project for the school year. Work collaboratively; students had been working individually throughout the two year course so it was very important that they interact with each other and experienced the team work and necessary conflict resolution and compromise that come with it. We brainstormed; I told students they would be in charge of their learning and that my role was more of a project manager. My students respond really well when given clear deadlines and a specific project and when they are treated as grown-ups in work environments with set responsibilities. Several ideas came up; I was not sure how the project would pan out because at this point, two weeks before the end of the school year, students were physically and mentally exhausted after sitting for an average of twenty grueling IGCSE exams over the past four weeks. I helped them shape and evaluate the feasibility of their ideas and we ultimately decided on a runway fashion show, with garments inspired by twentieth century art movements. 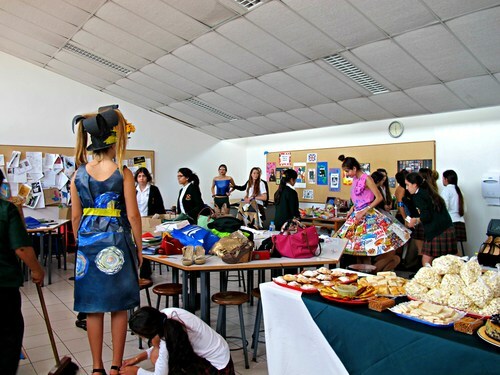 Students had to design the garment, style the make-up and hair themselves, make the garments and select one student to model the for the whole school community. I also asked them to not buy fabric or any other costly material for this but to rather use their creativity and try to recycle materials or use unconventional ones that could be easily found. We decided on five art movements: Surrealism, Pop Art, Cubism, Abstract Art and Post Impressionism. Form III Art History students were asked to be guest artists and designed one garment inspired on Peruvian Pre-Hispanic cultures. We had recently visited a museum and studied the marvelous work of our ancestors and this was the base for their design. Students first researched the art period/style to be able to design the garment coherently and it had to be wearable. At the same time, Form IV Art History students worked in pairs preparing exhibition panels with information about the featured art periods. Their job during the runway show was to engage the visitors in conversations around the styles before the fashion show began so the public would have a better understanding of what they were about to see. We did not expect the huge turnout we had; in past events of a similar nature we have had a lot of visitors but this event really caught the students’ attention and we had a problem fitting everyone in! The day of the event, the art studio was a whirlwind of creative energy and nerves as we prepped for the show; garments were being finished, make-up was being applied, walking was rehearsed-it was crazy! The school has a system of student officials for different areas of study; the Arts & Culture official MCd the event, guiding the public into visiting the exhibitions first and presenting the public with each garment, the names of the models and the designers. Participating students were extremely excited with the opportunity — it honed their interest in art and brought it together with their love for fashion design. The show was fantastic. The student models walked down a runway made with school stage boards to the tune of a special song for each art period while the visitors cheered and clapped and just beamed with joy at seeing this done in school. After the show, visitors were invited to enjoy refreshments we had prepared for them to celebrate the event and a year of art making at the school. The project was so successful in the eyes of the school that the headmistress spoke about it in her end of year speech for prize-giving day and the Deputy Headmaster publicly congratulated the students involved during assembly, speaking of how inspiring their work had been. What did students learn? I think there are many lessons here. Students hit on the academic aims set for the project but also learnt what a real life work environment can be like, that deadlines have to be met no matter what, how to deal with stress, that they can do more than they think they can and that team work is vital to produce anything. Through their words of thanks, their hugs, their smiles, I could see how moved and truly happy they were, ending the school year with a real sense of achievement and having grown to understand art as part of a bigger context and connected to life.